Shooting in this game is slow, with only being able to shoot 4 times on an empty space, but with a specific frame setup, it can extend from 3 to 5 times more. 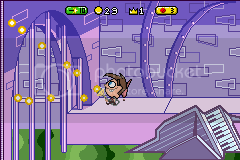 By simply doing a bunch of turbo A button inputs, Timmy will jump higher than a full input jump. It also lets you go to farther distances as well. This can lead to better shooting strategies. On the AMBUSH!, or GREAT! moments, a frame before it spawns, you can call Cosmo/Wanda and save few time. TODO: Put all differences from the thread so far and add/explain them here. TODO: Add a bunch of loads of gifs. Also more RAM addresses but for BizHawk.